MOST GYMS TAKE UP TO 520 WORKOUTS TO GET IN SHAPE. 4) we give you a written workout plan before you start. 5) you will workout in PRIVATE here, only you and the trainer in the workout room. 90% of personal training clients see success and are still working out after a year as compared to less than 1% of health club membership buyers. 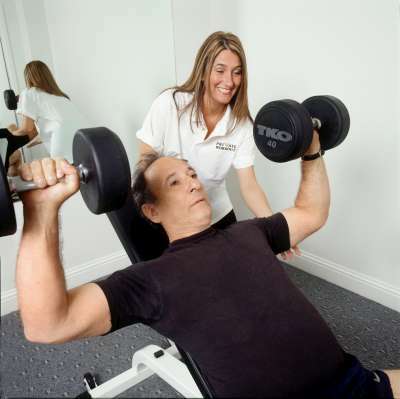 3. we specialize in 25 minute personal training sessions done on weight machines to DANCE music in a private room. 4. complete close to three times as many excercise repetitions in just 25 minutes as with an ordinary trainer in 60 minutes! *your results will vary depending upon attendance, adherence, effort, and consistancy. At Private Workout, we are serious about RESULTS. A typcial pesonal training session in Dallas costs around $75 is about 25 minutes of weight training, then 30 minutes on the treadmill. We offer sessions using weight machines and weight circuits similar to what pro athletes use. We put you on a workout plan that we have put over 28,000 people through and tweaked it over 52 times to get the best possible results. While most personal trainers "make it up as they go along," our trainers follow a plan that we know to work. In addition to traditional 55 minute session, we offer 25 minutes sessions on the weights only by a staff personal trainer for $40, then you can do the cardio equipment for 30 minutes (or more!) on your own, and we dont charge you for an extra 30 minutes! Most trainers tell you they are going to "vary the workout," which means that each day you will be doing something different in order to create "muscle confusion." What this really means is that the trainer is probably making up your workout as he goes along, because he wants you to be dependent on him, and does not want you to have a written plan that you could do on your own. We believe you should have a written plan, and be able to follow it if you should want to workout inbetween sessions with our trainer. We believe that the "vary the workout" thing is a gimmick since it is not done by pro athletes. Think about it, if you had a math test on Friday, and I taught you math on Monday, biology on Tuesday, history on Wednesday, and geography on Thursday, how well will you do on the math test on Friday? Pro athletes do the same workout every time, but make it harder each time until they hit the 99th percentile of fitness, and so do we. We believe in the "Hercules" method. The story goes that the 14 year old Hercules picked up a baby bull weighing about 35 pounds when it was born. Each day the bull grew and each day Hercules picked it up. As the bull grew to full size, Hercules was strong enough to pick it up! We start you with very light weight and high repetitions and each workout, we do more repetitions, or raise the weight so that you gradually get stronger and stronger, building back the 12 to 20 lbs of muscle that most 40 year olds have lost over time. This raises your metabolism back closer to where it was when you were twenty, and burns more calories and fat 24 hours per day! Most trainers have you do "traditional" workouts that involve sets such as "three sets of 10 reps" using only free weights. There are two types of muslce fibers, one is called "slow twitch" (meaning "slow to tire" think long-distance runner) which requires a light weight, high repetition workout to develop and tone. The other type is the "fast twitch" (meaning "fast to tire, but high burst of power, think sprinter) which requires a heavy weight, low repetition workout to develop. The "three sets of 10 reps" or variations of this simply do not address the real needs of either type of muscle fiber. 10 reps is too few reps to workout the slow twitch fibers, and any weight you can do 10 times is too light to work the fast twitch fibers effectively. We have developed a workout program, done either with free weights or on a weight circuit that we think is ideal for both muscle fiber types. While the average person can gain 6 pounds of muscle per year, we have had customer who gained 16 lbs of muscle in just 6 months! What that means to you is that you will spend less total time (and money) working out and reaching your goal when you work with us! The average 40 year old needs to workout for 40 months to get in shape, we believe we can get most in shape in 6 months or less! Do you think professional sports teams sit or stand on a ball and do arm curls? If they don't, why should you? Come to a serious gym, Private Workout. We won't waste your time or your money, together, we will get you results.